A few weeks ago my mother called me asking if I had heard of the Fitbit. I’ve seen a few friends sport it, and I knew it counted how many steps you took in a day, and how many times at night you’re not sleeping soundly, but I didn’t know much more than that. Just like that, I entered the world of wearable technology. With the Apple Watch looming on the horizon in 2015, I may as well get used to charging my wrist at night. I’ve always been wary of wearable technology, simply because my wrists are so small. I generally wear watches or bracelets fairly high up on my forearm because nothing fits my small wrists. Everything I wear on my wrist is generally thin, and wearable tech is bulky and thick. The Fitbit Flex is fairly thin, but sits tall on my wrist, making it still feel a bit bulky. Fitbit is nice enough to offer a variety of colored bands “for every occasion,” as well as recently teamed up with Tory Burch to make high fashion bracelets to attract women…some costing nearly $200. Fitbit says that you can put the small tracker in your pocket during the day, which I have done occasionally, but I’m sure my stats are skewed because of it. It’s for this reason I would consider purchasing the Fitbit One or Zip, which both have a clip for your bra or waistband. 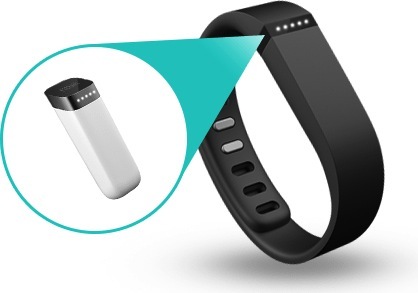 It took me a very long time to figure out what the Fitbit Flex actually was. I was staring at two rubber bracelets, a small piece of plastic with a USB attached, and some strange USB cable with some plastic attached. That plastic is the Fitbit Flex. It’s tiny, and lights up and vibrates occasionally, and I was staring at it without a clue what to do. After I figured it out, that the small little piece of plastic that lights up goes inside the bracelet, I was excited to see how it works. I headed over to Fitbit.com and created an account. I was introduced to a bunch of empty graphs, waiting to be filled with data. I added my current weight and other details, as well as goals I wanted to achieve. Nothing left to do but walk, I guess! Fitbit challenges users to take 10,000 steps a day, travel 5 miles, and be active for 30 minutes each day. It didn’t feel like much, but after my first few days using it, I realized how much I sat, especially during the work week. I was averaging about 4,000 steps a day, excluding the days I went on a run. I was also intrigued by the food tracker. As a member of Weight Watchers for over a year, I was familiar with tracking what I ate each day. Weight Watchers uses a mathematical points system for food and activities, whereas the Fitbit goes back to the basic concept of “calories in, calories out.” The Fitbit allows users to set a goal weight and BMI, giving users four options for calorie intake amount – “easier,” “medium,” “kinda hard,” and “harder.” For me, the calorie deficit was 250/day, 500/day, 750/day, or 1000/day. I chose “kinda hard” at -750 calories a day. Throughout the day, I am told how many calories I have “left” to eat – similar to Weight Watchers. If I know that I’m going to have a big buffet dinner, I can budget my day accordingly. Again, similar to Weight Watchers, more activity means more “points,” or in this case, more calories out earns more calories in. The numbers of in and out change throughout the day, which has lead to an interesting lesson in eating. Weight Watchers felt fairly limiting based on the points scale, and using the in/out calorie method, I feel less guilty about eating overall. I should also note that I am not looking to advise Fitbit, calorie counting, or Weight Watchers as the “best method” for creating a healthy lifestyle and weight loss. I lost 15 pounds while a member of Weight Watchers, but reached a plateau. I think that switching up my tracking system, as well as my new understanding of weight lifting, is going to give me the push of motivation I need. Fitbit allows users to set goals for steps taken per day, miles traveled, and even calories burned. Nothing is advised, unless you’re willing to spend $50/year for a premium account, which includes a guide on slowly becoming more active and burning more calories. Not being supplied much of a guide on my goals may become a problem for me in the future. What’s exciting is when I reach whatever my “main” goal is for the day. The “main” goal can be active minutes, steps, calories burned, or miles walked. The “main” goal is what is associated with the actual Fitbit, using five lights to indicate how close you are to achieving the goal set. Tap the Fitbit twice to see how far you are, and wait until you hit 100% to feel a celebratory vibration and light show – wahoo! The other neat feature that I simply have no use for other than intrigue is “sleep” mode. By rapidly tapping the Fitbit, it starts to track how well you sleep. In the morning, I wake it up, and I can check to see how many times I was “restless” during the night. How are these things measured? I have no idea, but I am restless about 4 times a night, apparently. The final feature worth noting is the alarm system. Ideal for those who share a bed and have different wake-up schedules (wahoo, not a problem I have. ), users can wake up to a quiet vibration instead of a blaring alarm. It’s also helpful for daytime alarms as a reminder to take a pill, make a phone call, etc. The alarm can be set on the mobile app or by logging on to fitbit.com, which is nice. 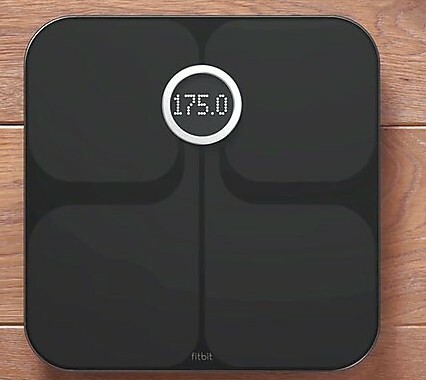 Fitbit also encourages users to purchase the Aria – a digital scale that also measures BMI and automatically syncs to Fitbit users’ profiles. 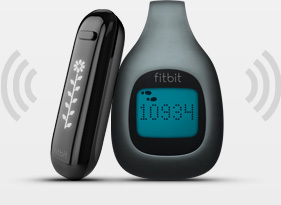 Even if multiple people have Fitbit, the same Aria scale can be used. Yes, it’s a bit of a scam, but I personally like it, simply for the BMI measurement. For the past six months, I have been at a frustrating plateau regarding my weight loss. In that time, I trained for a half marathon and completed it, and am now training for my second. By my logic, that should lead to weight loss, right? It hasn’t. My food choices, according to Weight Watchers, have been smart, and I visit the gym 3-5 times a week, including long runs. To not lose the weight, as well as still not feel good about myself and my image, is frustrating. I continued to recite the “muscle weighs more than fat” mantra in my head, that my weight may not change as I begin to lift more, but seeing the number on the scale stay within 4 pounds continued to be frustrating. Now, I’m measuring BMI, something that will change even if my weight doesn’t. Keeping it all inside of Fitbit helps me better organized, and more likely to achieve goals. One of the things I like about Fitbit is the social aspect. What I don’t like is the lack of search feature. Somewhere along the line, I connected my Facebook account to my Fitbit account. From there, it gathered up my friends who did the same and recommended them to me. The list was short, but I was unable to link any other social media accounts to my profile, nor search for users. I like social media, and I like using my friends to hold me accountable to achieve my goals. I wish there was a better way for me to find friends on Fitbit without directly asking them to send me the link to their profile. Do you have a Fitbit? Enjoy it? Am I missing something? Leave your comments! My biggest issues with the Flex are that the contacts get crappy really quickly so I have to jiggle and wiggle it a bunch to get it to charge. Second, the metal clasp rubs against my Macbook and totally botches the finish on it, that wasn’t fun. Now I end up wearing it on like the middle of my forearm with the band on the biggest setting. Like I said, I’m pretty used to tracking my food because of weight watchers. It’s useful for me because I don’t have much self control when in comes to eating. I really do hate (like I mentioned) the bulkyness of the band. I know you don’t care much as a guy, or maybe you do, but the wristband never works with what I’m wearing, especially when I’m dressed nicely for work. I’m usually awkwardly attaching it to my belt loop, putting it in my pocket, or looping it around my bra. It would be easier if I had went with the clip version, I think. I have to shove it up my arm too, for the same reason. It gets in the way. Wearable tech has just been getting more and more common, though, in my opinion. Maybe someday it’ll just be something everyone has?